When I worked on The Wild Party menu (drinks to follow), a non-drinking castmate asked if I might prepare something for special for her. I did, and I named it for for her. 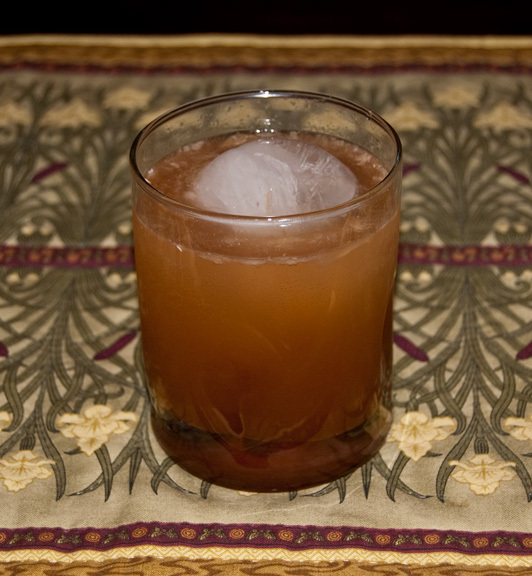 Shake with ice, then strain into old fashioned over ice, topping with 2-4 oz. club soda. So I generally get fairly positive reactions when I mix my drinks for my friends. Occasionally they might be too strong, and at times they aren’t to the taste of everyone, but for the most part I’ll get a thumbs up (and they’re not always sparing my feelings!). With this drink, though, I received more praise than I had for any other drink I mixed at that party, and I had requests for it all night by drinkers and non-drinkers alike. I like it particularly for the saltiness that comes from the Ponzu in combination with the tart of the lime. The bitters along with the sweet orgeat introduce some exotic undertones that help to relieve the drink of its simple fruit juice mix origins. Top with as much club soda as you need to lighten up the resulting mixture, which is yummy, but thick — not in a viscous way, but rather in concentrated flavor. It also helps to extend the life of the drink, which, for me, disappears pretty quickly. Case in point: after the picture you see above was taken, the drink was downed before I even made it back to the kitchen. Ah well. I’ll just have to mix another.